You are here: Home / Auctions / Holy Cow! The Pope’s Lamborghini will be Up for Grabs! Or should we say, holy bull? Pope Francis’ Bianco Monocerus Lamborghini Huracan will be sold of at auction on 12 May at RM Sotheby’s in Monaco. But the pope never intended to drive the car around Vatican and leave burn marks around the Sistine Chapel, he simply signed on the hood so that it could be auctioned off. The money that the Huracan will fetch will be used for charitable organizations. Neat idea. 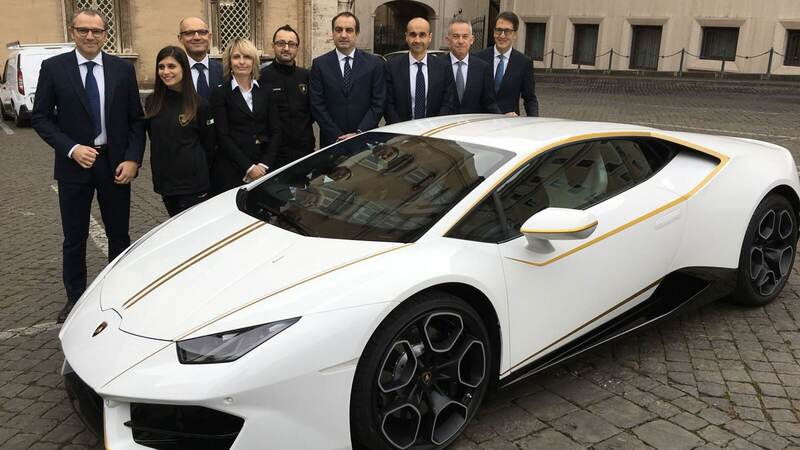 Unique to this Lambo are its Giallo Tiberino pinstriping, Nero brake calipers, and Bianco Leda Sportivo. Which in English is ‘white leather’. And of course, the pope’s signature on the car’s bonnet is one-off. We reckon that even without these unique touches from Lamborghini’s Ad Personam customization program, the signature alone will rake in the cash. And speaking money, the expected take price of the mid-engine supercar is between €250,000 to €350,000. However, this figure might skyrocket if people are either feeling charitable or they want a V-10 engined popemobile to make donuts. Holy donuts. 70% of the proceeds will go to Niniveh, an Iraqi city overrun by the terrorist group ISIS. 20% will go to other charitable groups and finally, 10% will go to the Pope John XXIII Community Association. We’re projecting it will cross the €500,000 mark. Yay, charity!